Electronic Assembly Manufacturing, Inc. (EAM) is an experienced source for high quality, high performance RF and Microwave coaxial cable assemblies that are used in commercial, industrial, medical, and military applications. 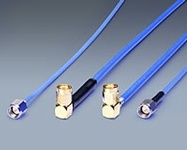 Cable styles include: Corrugated, Flexible, Hand Formable, LMR, Low Loss, RG, and Semi-rigid. In addition to offering quick turn-around and great pricing on all standard and custom cable assemblies, they offer application engineering support.